One area that will need our vigilance again is with a plant known as Purple Loosestrife (Lythrum salicaria L.) New plants were identified during the Phragmites treatment and removed from the NW and the SW Much has changed with the logging situation on the Island since our last newsletter. The Michigan Department of Natural Resources (DNR) has let clearcut contracts for 40 acres between Fox and Greene’s Lakes, and has let “selective cut” contracts for an additional 155 acres north and east of Greene’s Lake and its bog. Logging is being done by Pinney Logging of East Jordan under a negotiated contract with the DNR. Thirty acres spanning Camp 3 Trail have already been clearcut, as you can see in the photo (above). Logging operations so severely damaged the road that over 30 truckloads of gravel and clay were brought in by the Charlevoix County Road Commission to rebuild the road’s surface to keep it passable. Most of the trees taken were sent to pulp mills in the Upper Peninsula, despite the presence of beech bark disease in Island trees. Preliminary examination of documents obtained through a Freedom of Information Act request reveal some interesting aspects to the DNR’s logging on the Island. Typically, the DNR opens a bidding process for logging which results in bids going to the logging company which bids highest above the state’s baseline appraisal of value. Looking through the past five years of bids on the DNR’s website, winning bids range from 40% to 200% above the state’s appraisal. In the case of Beaver Island’s forest, no bids were received, so the state negotiated a contract with Pinney Logging that pays the state 70% below the state’s appraisal. No notice was given to Islanders or to local government of the DNR’s intentions. 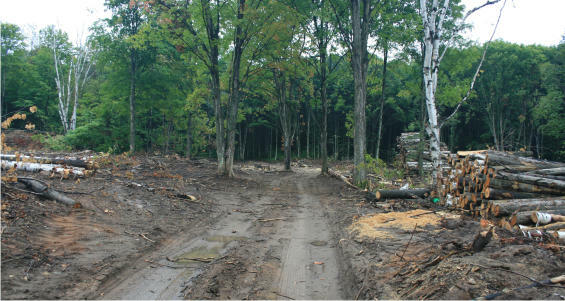 In October 2006, I reported a conversation with DNR Forestry Sales Agent Greg Gatesy in which he stated that no clearcut contracts had been let for the Island— only selective cut contracts. His statements were in obvious contradiction to the clearcut contracts discussed in a DNR management team conference call on May 16, 2006, and in contradiction to a Pre-Timber Sale Checklist signed by his supervisor on August 21, 2006. According to the DNR’s “State Forest Land Resource Assessment Checklist” proper procedure includes: Gather input for the proposed treatment from interested associations, advisory groups, interest groups and the broader public. Associations and advisory groups for major program areas typically include fire, recreation activities (e.g., motorized trail users, hunting interests), timber, wildlife and fisheries management interests. This checklist item stands in apparent contradiction to the “Pre-Timber Sale Checklist” completed by the DNR on August 21, 2006 in which the DNR forestry sales agent checked “no” to the item “Were neighbors notified of DNR’s intent to harvest adjacent to their property?” In the same document, the sales agent states “There is no residential in the area” despite the fact that one home stands less than 1,200 feet from the logging area, and there are eight homes within a half-mile. Of those homes, five abut Camp 3 Trail, the single-lane county road used for all logging activity at the DNR sites. 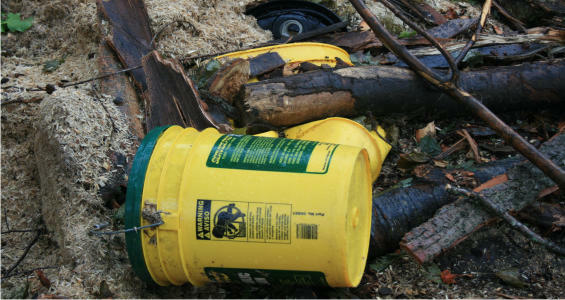 One of several hydraulic fluid buckets seen on the first clearcut site. Letters and email sent to the DNR in 2006 expressing specific concerns and requesting additional information went unanswered. Combined with the logging activity, all this raises questions about the DNR’s stated commitment to being a “good neighbor.” Is this the way we want the State of Michigan to manage its resources and interact with its citizens? We invite you to tour the clear-cut logging site on Camp 3 Trail to see the State’s practices first-hand.